Return of the giant hogweed? This summer has seen numerous stories in the media about giant hogweed, including plenty of cases where people, particularly children, and even pets, have been injured after coming into contact with it. My fascination with the giant hogweed began in childhood when on holiday in Cornwall one year. There was an article in a local newspaper with a remarkably familiar story of some boys who had used stems of the plant to have a sword fight, and had been burned in the process. The idea of a plant that was not only big and impressive, but also dangerous, and even more dangerous in sunny weather, somehow appealed to me and seemed to be something worth looking out for. It must have been the late ’80s when I saw that newspaper article. But then Genesis even released a song in the early ’70s entitled The return of the giant hogweed , which more or less tells the true-to-life story of how the plant was first brought here from the Caucasus Mountains (albeit with a touch of John Wyndham). Yet from the recent newspaper reports, you would think giant hogweed was a new threat that has only just emerged in this country. Giant hogweed, Heracleum mantegazzianum, was first recorded as growing in the wild in Great Britain in Cambridgeshire in the 1820s, so it’s been here for 200 years and is hardly a new arrival. But why spoil a good headline? Some tabloids have even branded the plant the “Taliban weed“, claiming it comes from Afghanistan. (I thought the Caucasus were between Russia and Georgia.) The newspapers appear to have caused some panic among the public this summer, with some people scared to walk in the countryside as a result. Yet despite being on the lookout for this plant for the last 25 years, and walking in many parts of the country, I have very rarely seen it. It surely can’t be as widespread as the tabloids are making out. I suspect many people are confusing it with the native hogweed, Heracleum sphondylium. There was an article in the Oxford Times earlier this month where a lady was complaining about council inaction over “giant hogweed”, yet the plant shown in the picture is clearly not giant hogweed at all (it’s most probably common hogweed). There are, however, some voices of common sense. Experts in Warwickshire have urged people not to let fear or giant hogweed spoil their enjoyment of the outdoors. Parents teach their children not to brush against stinging nettles, or for that matter not to eat deadly nightshade berries or mess with all sorts of other hazardous plants. People just need to know not to touch this particular plant, either. In that respect, the newspapers are performing a useful function. However, in a year or two, no doubt people will have forgotten about giant hogweed – exactly because it isn’t really that common – and in a few years the cycle will repeat with a load of new stories about people being injured by it. It’s not really the return of the giant hogweed, just the return of stories about it. It should be easy to identify giant hogweed, not least because of its size, with a height of up to 5 metres, leaves a metre long, flower umbels 50cm across, and stems up to 10cm in diameter. Its leaves are much more serrated than common hogweed, and the umbels contain far more individual flowers, whereas common hogweed typically only has a dozen per umbel. Giant hogweed also has purple blotches on its stem. It is a member of the Apiaceae or carrot family, and in common with relatives such as carrot and parsley, it is monocarpic, i.e. once it flowers, it dies. It usually grows as a biennial, putting out leaves in its first year, storing energy in its roots, then flowering in the second year. It can flower in a single year, or may take several years, particularly if it is cut back. However, it only flowers for one year, and doesn’t mature like a tree over the years, as some sources seem to imply. Its danger lies in chemicals called furocoumarins, which are a defence mechanism against various types of pest. These chemicals cause skin that has been in contact with the plant to burn when exposed to ultraviolet light, which is why the effects can be worse on a sunny day. It is actually perfectly legal to grow giant hogweed in your garden, should you be so inclined. It was originally introduced as an ornamental plant, after all. These are a few laws that apply, the best known being the Wildlife and Countryside Act, which makes it illegal to plant or cause it to grow in the wild. This act usually only applies to animals, but a small number of invasive plants are specifically scheduled. Giant hogweed is also covered by hazardous waste regulations, so if it’s cut down, it can’t go in with the normal garden waste. Finally, recent laws give local authorities powers to order people who fail to control invasive plants on their land to act, ultimately with a hefty fine or even prison sentence if they ignore it. (The usual advice for controlling the plant is to use Roundup, but this is being progressively banned around the world due to health concerns – good news for giant hogweed.) I don’t really know why anyone would want to grow it in their garden. While it is a large and impressive plant, it does look like many of the common weeds that grow everywhere. 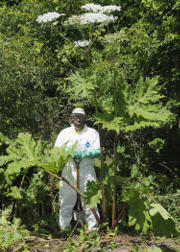 Giant hogweed can be an problem when it does colonise large areas, usually along river banks. It is a real issue along some rivers in Scotland in particular, as these dramatic images from a drone show. Not only does it prevent people from enjoying the river, it crowds out native plants, and once it does, the hole where the roots were causes the river bank to erode. This is an issue largely confined to waterways, though. The plant thrives next to water, which also carries the seeds downstream. The oversize giant hogweed has an equally formidable-looking botanical name, Heracleum mantegazzianum. 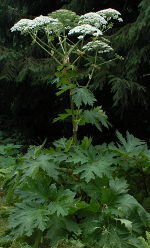 It is clear that the hogweed genus, Heracleum, comes from Heracles or Hercules, due to the plant’s Herculean size and stature. In the 19th century, when European explorers were discovering new plant species, they each classified plants they encountered as they saw fit. When giant hogweed was first brought to Great Britain, it was most likely known as Heracleum giganteum. French-Italian botanist and anthropologist Stefano Sommier (1848–1922), and Swiss-Italian doctor and botanist Emilio Levier (1839–1911) visited the Caucasus in the late 19th century, and named giant hogweed in honour of the Italian polymath Paolo Mantegazza. Their choice of name was to become the accepted scientific name for the plant, as is still used today. Paolo Mantegazza (1831–1910) is himself a fascinating figure; a neurologist, physiologist, and anthropologist. He travelled and lived for a while in South America, and some of his best known work is on the effects of coca leaves, which he experienced first hand. Yet he was not only a scientist, but also an author of fiction. His The Year 3000 predicted technological developments including artificial intelligence, modern aircraft, prefabricated buildings, air conditioning, credit cards, and instant global communications. However, he didn’t just predict scientific and technological changes, but also social ones: for example, the couple depicted in his book spend a five year period together, “with love but not children”, before they marry. He also correctly predicted the First World War, with “One million deaths in a single day”. Just about the only thing he got wrong was the timescale, which was out by roughly a millennium. It’s worth remembering that, at the time, the Catholic Church strongly influenced science and culture in Italy, and his views on sexual liberation can hardly have been met with official approval; nor could his scientific views, as an athiest and staunch defender of Darwinism. The Church may have found Mantegazza’s views toxic, whereas to others he was an impressive giant, which perhaps makes it fitting that the toxic but impressive giant hogweed is named after him.